The Compact Muon Solenoid (CMS) experiment is one of two large general-purpose particle physics detectors used at the Large Hadron Collider (LHC) at CERN in Switzerland and France. The goal of CMS experiment is to record the results of extremely high-energy proton collisions, and to use the data to investigate a wide range of physics, including understanding the Higgs boson, searching for extra dimensions, and particles that could make up dark matter. CLASSE's experimental particle physics group collaborates with many other groups from all over the world to build, maintain and operate the detector, and to extract and analyze the vast amounts of data it produces. Our group currently consists of five faculty members, around 10 Graduate students, 5 postdocs and several undergraduate students. We are responsible for operating and maintaining aspects of the pixel detector, for future upgrades of this and related systems, and for aspects of the CMS software. Our data analysis efforts encompass Standard Model top quark measurements, as well as searches for New Physics such as Supersymmetry. 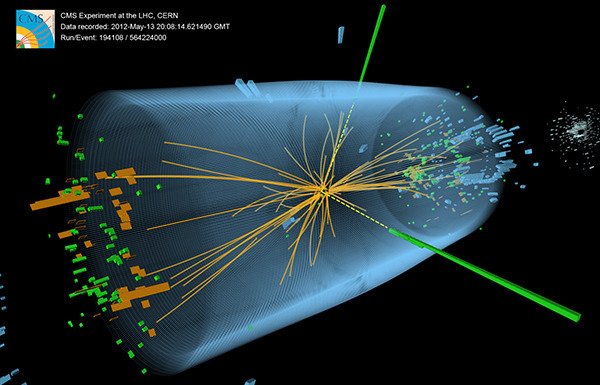 An event recorded with the CMS detector in 2012 at a proton-proton centre-of-mass energy of 8 TeV. The event shows characteristics expected from the decay of the SM Higgs boson to a pair of photons (dashed yellow lines and green towers). The event could also be due to known standard model background processes.